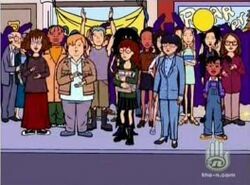 "I Loathe a Parade" was the sixth episode of the fourth season of the Daria TV series (episode number 406). It first aired on MTV on April 7, 2000. This episode was written by Dan Vebber. When Jake sends Daria to the drugstore to pick up some toilet paper (he found out too late there's none left in the house and he's just had chilli...), Daria discovers that she's walked right into the middle of the Lawndale High homecoming parade and can't easily escape. In her first attempt to leave, she runs into Jane, who's waiting on a late Tom: they had a date to "chronicle the anarchic death spiral of western civilization" (read: make fun of people). Daria attempts to flee home, only to be thwarted by Ms. Li's traffic control, then by an overly pushy Lawndale Lions mascot, then by a lost Tad Gupty. Cursing her concience, she decides to help Tad find his parents. Along the way, they run into Tom, who's waiting for Jane -- he went to the wrong pharmacy -- and the three of them hook up to search for the Guptys. At first, Daria is her usual aloof self towards Tom, but she eventually starts to warm up to him through their adventures, including hopping the Fashion Club's float -- with Daria narrowly escaping a makeover -- and when he fends off the pushy mascot. They also cheerily witness the near-injury of dozens of people when the floats crash. When Daria apologises that Tom didn't get to enjoy this with Jane, he mentions that Jane would probably be ignoring him now to take photos: "you know how she is". Then they realise Tad's vanished. Tom and Daria search for Tad (and realise that Daria's lost the toilet paper), in the process saving the mascot from suffocating in his costume. It turns out the mascot was Mr. O'Neill, who apparently "always go[es] overboard" when he "cuts loose". Eventually the teens find Tad, whose parents found him, and Daria is perked up when Upchuck pisses off two policewomen and gets a beating. As she and Tom laugh together, Ted DeWitt-Clinton takes a photo of them as he's taking shots of all "couples". Daria and Tom point out they're not a couple, which is when Jane finally finds them. As they head out to get some pizza, Daria is suddenly soaked with blue and yellow paint by two kids having a paint fight. Tom and Jane try to convince Daria to come along anyway, but she begs off. They eventually leave, but as they go, Tom steals a glance over his shoulder at a lonely and miserable Daria... and the viewer is left wondering if there might be more going on than meets the eye. Homecoming parades are associated with football season and take place in the fall, when this episode can't take place because previous episodes claimed that spot, another ep was set around spring-ish, and we're nearing summer. Given that Kevin wears his football uniform at all times and that the Lions are playing a football game four weeks after the Super Bowl in "Fizz Ed", some speculate that Lawndale also has a spring football season, making the parade of the the title a Spring Homecoming Parade. Replacing the original music does undercut the punchline of Tom and Daria looking at each other, as the original end credits song was "I Know There's Something Going On" by Frida ("I know what you think and what's in your mind/So darling, look, why pretend"). This episode is notable for featuring return appearances from several one-off characters -- the Gupty family and Ted -- and a few members of the Daria production staff turn up in the background, including Glenn Eichler. Daria is completely unaware it's homecoming night, which pushes credibility a bit. One float shows a Lawndale player ripping the head off a penguin. When their rival teams were listed on Cleatopia.com, there's no team called the "[school name] Penguins"; did Cleotopia miss one or is "the Penguins" a nickname? This page was last edited on 6 May 2018, at 13:33.